Just sharing . . .
Another important portrait of the period is that of Associate Justice Jorge C. Bocobo, commissioned by his son, Israel. Instead of doing a formal portrait, the artist superimposed symbols in circular and prismatic forms, on the face of the subject. Nonetheless, it achieves a striking likeness and the work itself was used as model for a commemorative stamp. 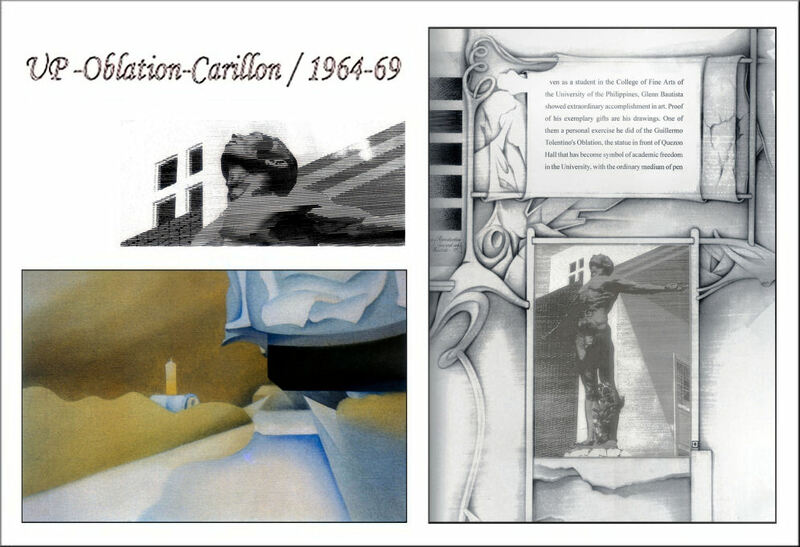 Glenn Bautista also did a few landscapes in this period, one of which, entitled Carillon, alluding to the familiar feature of the university campus, foreshadowed his later concern with space. Almost abstract, the painting is minimal it its elements; its strong linear perspective serves to set off the large sweep of road, a modulating light blue against the burnt sienna of the surroundings, the structures of the buildings cropped and barely suggested. 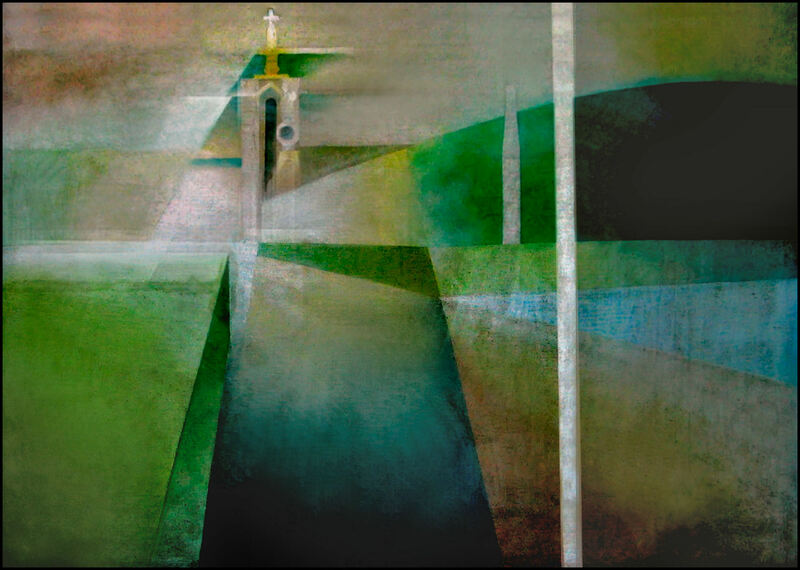 It is a work which bears affinities with the urban landscapes of Lyonel Feininger with their emphatic direction lines, structural aspect, and minimal detail. 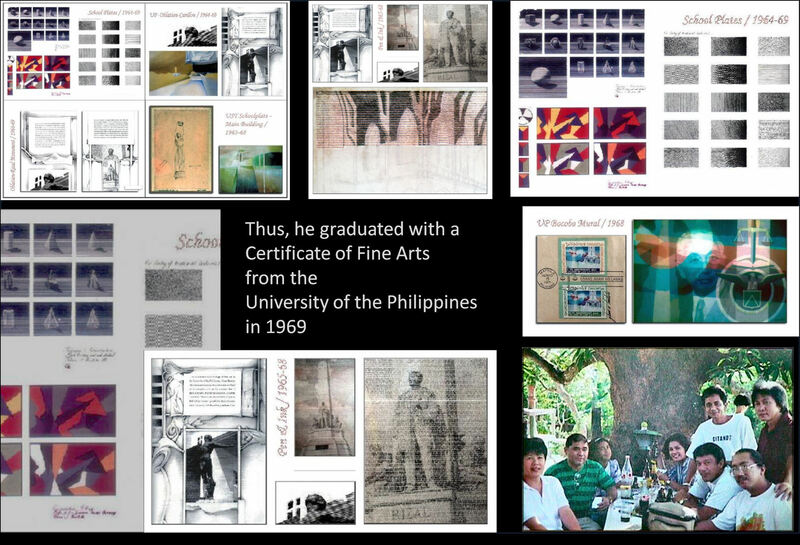 • Glenn A. Bautista: Here’re are some comments from Dan-dan’s previous posting of my sketch with Prof. Jose Joya. • Glenn A. Bautista: Yes, Dan-dan, I remember this sketch . 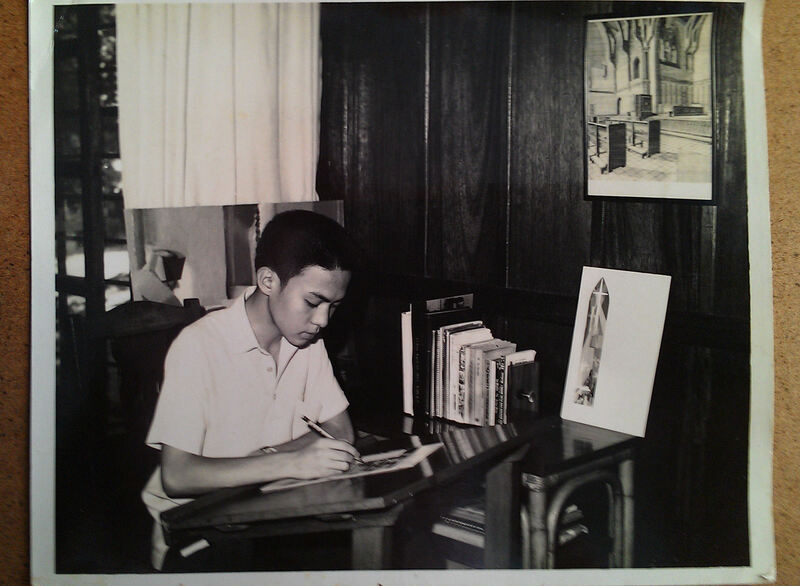 . . my godfather, National artist, Jose “Peping” Joya invited me to join his drawing class when I visited the UP College of Fine Arts. I remember him telling something to his class about this sketch. Can you take a better photo using daylight w/o the glare so I can include this to my art site? How did this sketch get to your mom? Can you ask her? Now, can you guess what the drawing is about? This is a rare drawing in a rare setting. Thanks for letting me know. Meron pa bang iba? Can you take good photos for my site? I know you have a few more pastels. Just angle the framed pastels so you don’t get the glare, and background it against a dark background so as not to have a reflection or mirror image. Thanks a lot . 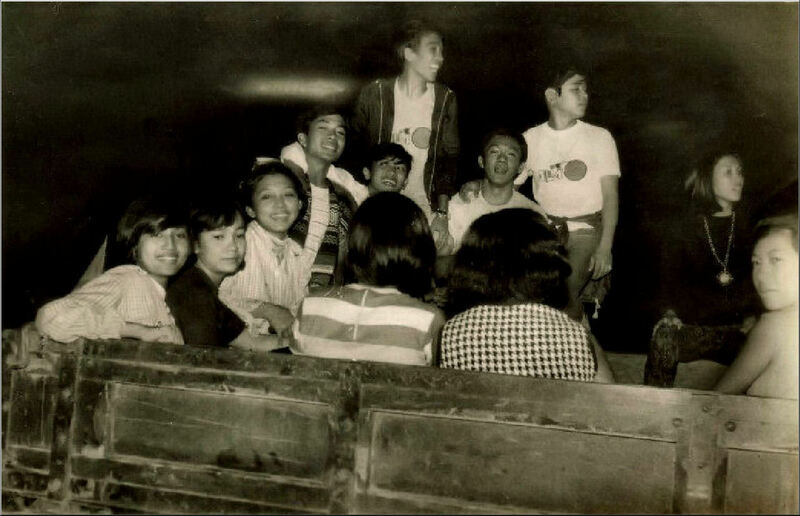 • Alfredo Roces: Glenn, I recognize tha back of Abe Cruz and beside Baby is Tony Quintos. Both Tony and Abe have left us. God bless, – Ding. 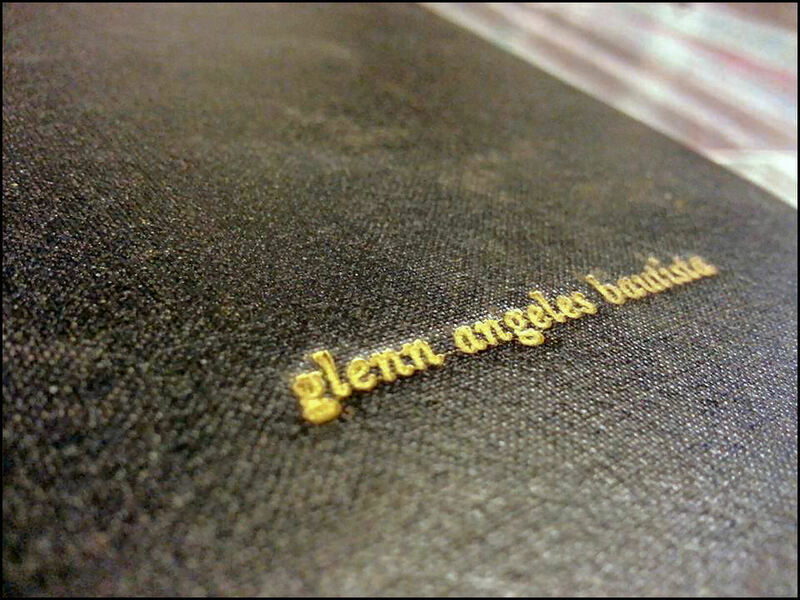 • Alfredo Roces: keep on writing about your times Glenn. 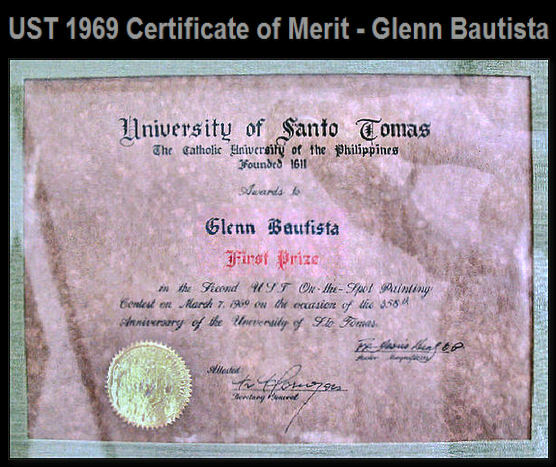 • Glenn A. Bautista: Yes, DingR, I have been digging up images from my hard disks and photos sent in to me by David, many of which I had not seen. Just organizing these images is not an easy task. But having the present digital tools right in front of me, I should not really be complaining. Now, I seem to understand why you love to write, a skill I have totally neglected. Thanks, DingR . Ernesto V Enrique: Familiar siya. Di naman natin kaidad? Armand Bacaltos: Kasama namin sa Available Light Movement at Ma’s Concern singing group, Tats. Shell winner sa photography. Armand Bacaltos: Natatandaan siguro sya ni Boy Y.
Ernesto V Enrique: I-share ko lang kay Boy. Armand Bacaltos: Di na nga nya naabutan yung awarding sa Shell. Maria Natale: I can still see you playing the piano at Vinchu’s house that night. You are truly missed. Armand Bacaltos: Santy and I were spared the grief of that tragic event as we no longer proceeded to Vichu’s place after coming home late from the Shell on -the-spot contest in Kawit, Cavite. 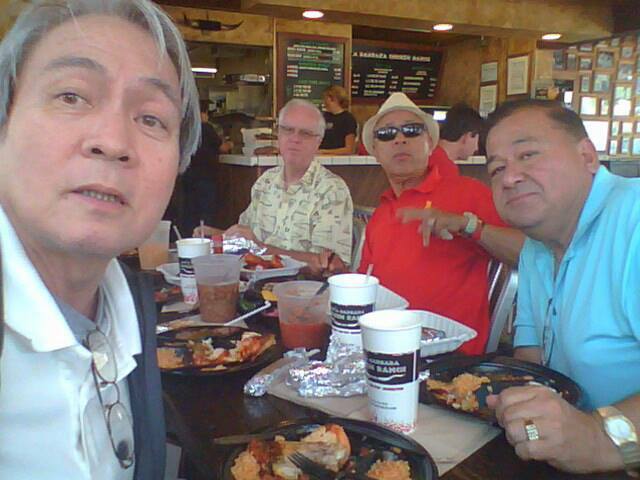 Len Francisco: Thanks for the memories, Pohl! Glenn A. Bautista: I can still hear his low voice at d upcfa restroom, close to d mirror on d left corner, “pastor, ano pakulo mo ngayon? . . .
Alex Gaddi: Really miss those characters. I should’ve spent more time with you guys after college. Glenn A. Bautista: Bim, pati ba c Bert? Glenn A. Bautista: “namputchat naman. . . d bale, kitakits na lang sa kabila . . .
Maria Natale: Si Ody din RIP na di ba? Vinchu Lapid: Dami na Medy. Sonny too. Maria Natale: We should really stay in touch these days! Keep the good friends near. Glenn A. Bautista: Maria, Ody slept with me for a few days when I was staying in San Francisco del Monte, QC. His small car was so heavy and I was surprise to find out what was inside . . .
Glenn A. Bautista: Maria, it didn’t look like d Volkswagen, that was Bing-bing’s, right? Perhap’s this was Sarah’s time . .
Glenn A. Bautista: Naalala ko tuloy yung kwento kay Rebillion na nakaitim at mahaba ang buhok . . wala na siguro yung “citroen” nya na may butterfly sa taas ata? Cno ba nag kwento nito? Glenn A. Bautista: Sinong online sa facebook video chat, parang masarap mag tsismis, hehe . . ? Cary Abeleda: It was me!! Didn’t get to see his wheels though. Glenn A. Bautista: ah, that’ right, Cary . .
Glenn A. Bautista: Is this the June I know? . . musta na? Glenn A. Bautista: Tahimik c Pohl pero pag tumawa, super lakas at tuluy-tuloy . . I can still hear him laugh. Emmanuel Garalde: Thank you Bim. Forgot about September 25. The day started with us shooting the ROTC parade in review at the sunken garden. There was so much happening and excitement. We took a lot of pictures. A guy running in the middle of the field in uniform then, taking it off and setting it on fire. Then a group of ROTC officers giving him a flying kick and beating him up. Remember, this was during the height of student activism in UP. After this event we went to Vinchu’s house. He must have been so tired. But very happy. He was joking and laughing a lot. We did not know he was sick. His heart just stopped! Imelda Cajipe Endaya: Remember Pohl. Was it 1971, Bim? 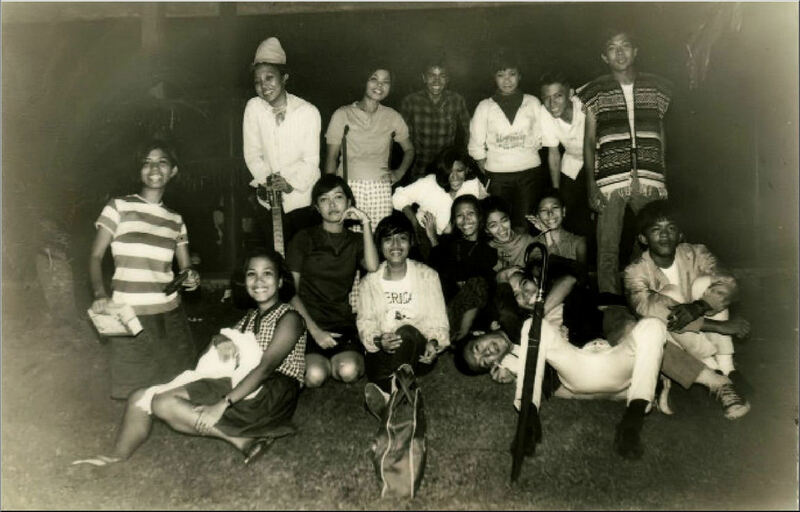 Parang earlier pa, I think we were only 17 or 18 then. Peggy Bose: Happy birthday , Pohl. We remember you in our prayers. Emmanuel Garalde: Yes Peggy. Let us remember and pray for Pohl, Santy, Ben, Bert, Ody, Sarah, Ed M., Sonny Barros, Tanglung Simpliciano. Peggy Bose: And Sonia Barros and Liza Salazar. And Papu Leynes and Ed Araullo and Egay Navarro. I do enumerate them , and us too, when I pray. Armand Bacaltos: Meps, yes it was…can’t ever forget the date. Must be ironically because Santy and I weren’t there when it happened that made it more unforgettable. Imelda Cajipe Endaya: Lord God, thank you for the lives of those who have gone ahead of us. Eternal peace to their souls. And grant Your light and grace to us who continue to live earth’s journey. Vinchu Lapid: Ang dami ng gone. Thanks for the list Noli and Peggy. I will be praying too. And I pray for our health specially Glenn’s and Beth Garalde’s and Ed Soriano’s. Thelma Aranzaso Soriano: Hi Vinchu ! Hi everyone! Ed says thanks for remembering him. Yes let us pray for good health and accepting old age is a reality !!!! Donna Lynn Abaya Caparas: Hey, that’s Uncle Babut. Thanks for sharing. Teresa Liceralde Elloso Celdran: …they have left behind. Yes Pohl Soller, the boyish man behind the camera…you will always be remembered. Melinda Soller-Abaya: To all the friends of Pohl…. Thank you for your prayers. We truly miss him. 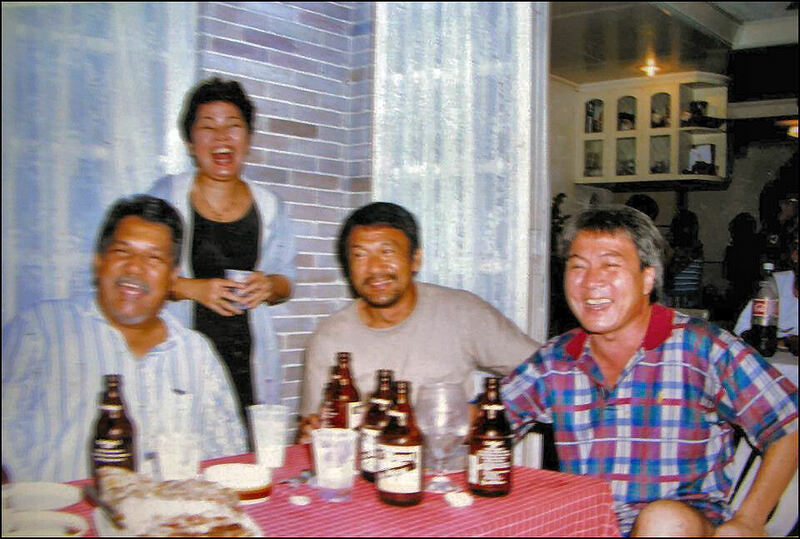 Vinchu Lapid: Thelma, Prayers for Len’s Tata too. Sonia Carreon: Thanks for the tag, Bim. So sorry to learn about the passing of Pohl just now. I remember him well with that colorful vest and his camera. May he rest in peace of the Lord. 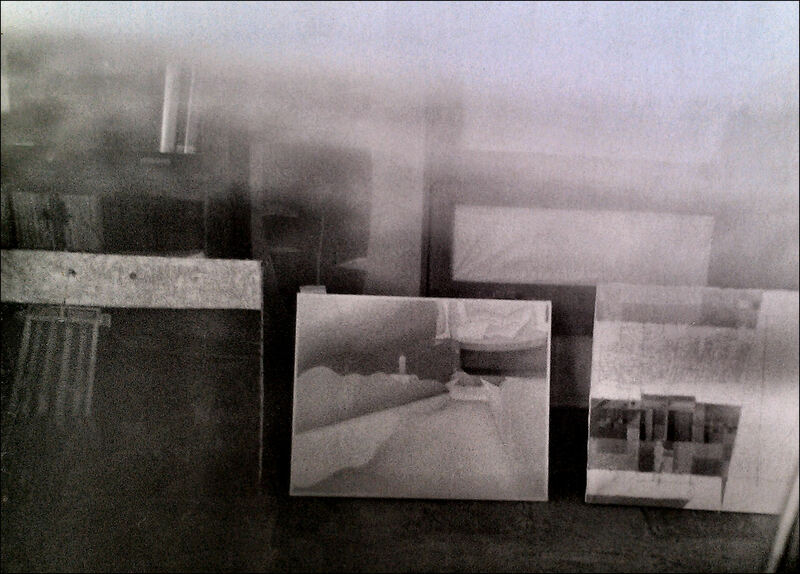 Emmanuel Garalde: Glenn, Pohl’s negatives might be in your house in BF. Lots of memories in those fotos. Len Francisco: Salamat Bim for posting and tagging, at salamat rin sa mga Joaquinisms. Pampasaya ng araw, keep ’em coming! Emmanuel Garalde :Good P.M. , nice to hear from you Manang Linda, Do you still have Pohl’s Album. I would like to copy them. 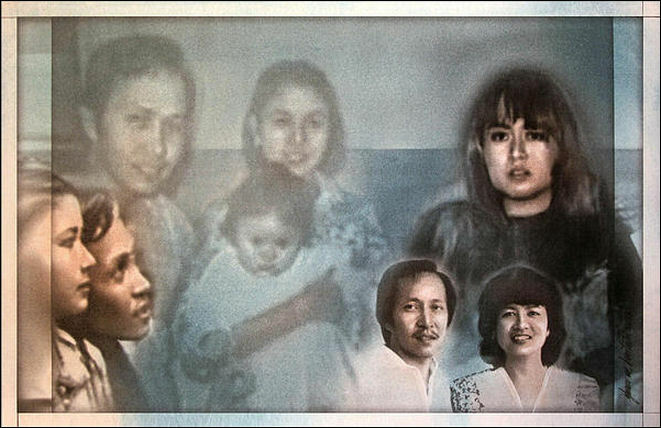 Thelma Aranzaso Soriano: Sept 25 1971 will forever be in my mind! Remembering Pohl and Teresa! We miss you ! Glenn A. Bautista: Len, sis . . may pangkontra naman sa lahat, choles & Inflamm–>krill oil, sugar–>cinnamon, osteoarthritis-ginger & dr, scholl orthotics, pain –>search “melt method”, walang gastos . . just ask dr. glenn, ok? Emmanuel Garalde: Glenn, remember this. I took a picture of this painting with my phone. The painting is at the executive house, the residence of the U.P. president inside the Diliman Campus. The U.P. president is Fred Pascual, husband of Menchu Martinez, kasabay natin sa Fine Arts. Glenn A. Bautista: Yes, Noli. I distinctly remember this artwork. UP Pres. S.P. 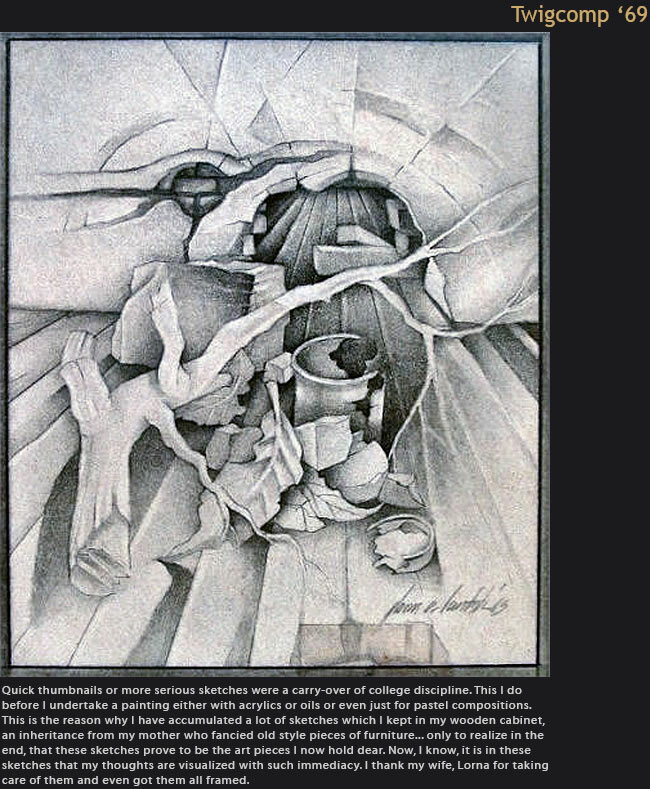 Lopez asked me to see him at his office (admin-where the Oblation is) and found this artwork hanging on his office wall. This was my entry for an On-the Spot art competition in Baguio that placed 2nd, I think. I think you were there too, got bored and headed home to Manila. The proud Glenn protested that this artwork should have been 1st place, hehe. Lito Carating got the 1st place. I didn’t know that then, when I protested. I had to explain that to Lito after the competition. 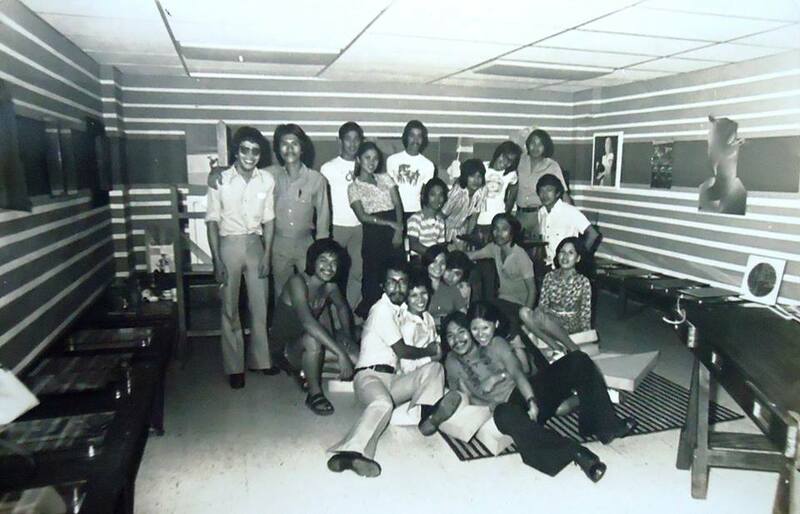 Because of this incident, Pres SP Lopez commissioned me to do a wall mural 12 feet x 36 feet for his office (admin). There were times when the Board of Regents met with SP, and I was asked about certain issues concerning UP while I was up there on a scaffolding painting, hehe. Glenn A. Bautista: Exchanges with Meps: Imelda Cajipe Endaya: What’s the year of this painting? Undoubtedly one of the most gifted artists of his generation, Glenn Bautista believes in total creativity. Wide-ranging in his production, he has distinguished himself in painting, whether in oil, pastel, or watercolor, in printmaking, particularly lithography, and in sculpture, freestanding or relief. He knew his artistic vocation from an early age — he was born in 1947 in Orion, Bataan — and he has since pursued his career with a single-mindedness of purpose. 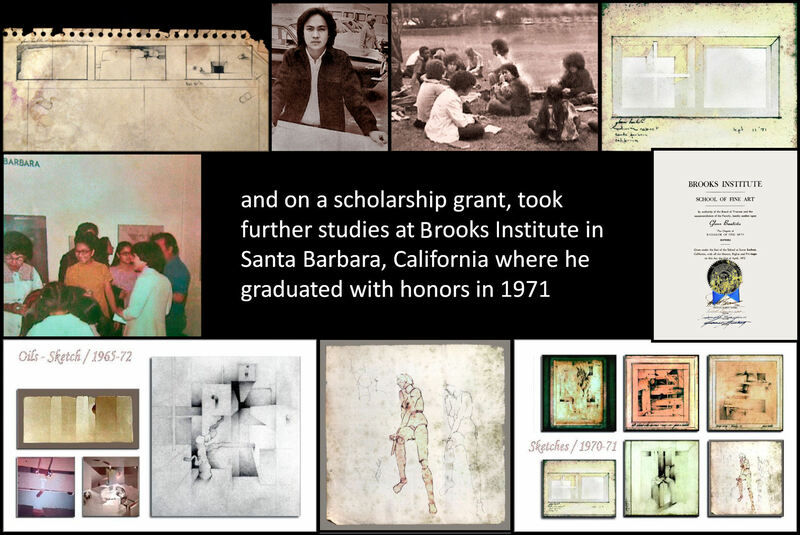 Thus, he graduated with a degree of Fine Arts from the University of the Philippines in 1969, and on a scholarship grant, took further studies at Brooks Institute in Santa Barbara, California where he graduated with honors in 1971. He has recently come back from Germany where he specialized in lithography at the ‘Kunstakademie’ in Dusseldorf and experimented with new materials and processes. Bautista’s recent shows cover his artistic production for the last three years, with most of the works done in Germany. It is significant here to note that during the time he was there, he won an ample measure of critical recognition as his works have become part of the permanent exhibit at the Galerie Art 204 at Rethelstrasse, Dusseldorf, in the company of the works of Josef Beuys, and the masters Chagall, Dali, and Miro. His one-man show at the Gallery Genesis this September attests to his prolific expression and consistent excellence and includes works in various media: paintings in pastel, mixed media works, collages, and works on handmade paper, photographs, lithographs, and cement sculpture. 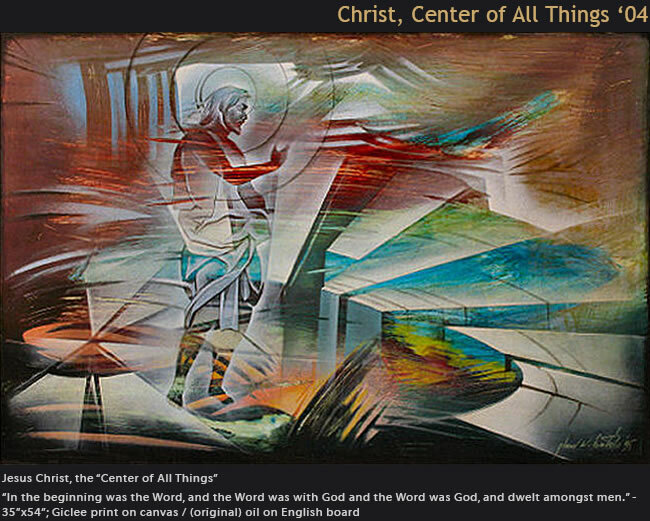 Glenn Bautista started in the mid-Sixties as a painter of religious subjects and portraits. 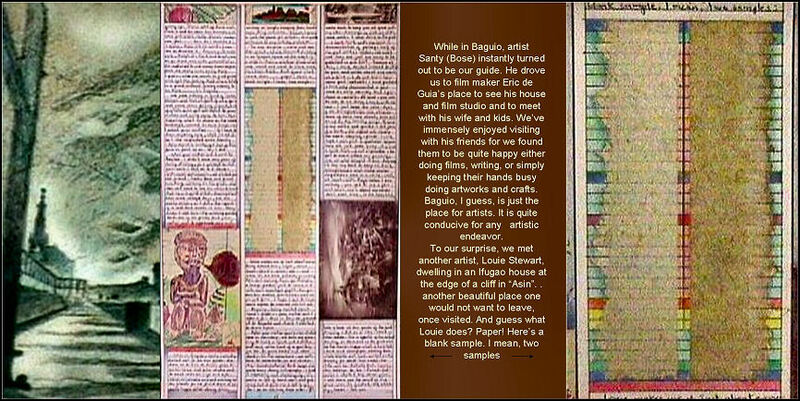 From the start, however, his art bore the stamp of his spontaneous originality which is the constant characteristic of his work. His early paintings of religious subjects done in the idiom of transparent cubism, more curvilinear than geometric, and which had a luminous stained-glass effect, endowed the traditional subjects with a new freshness and spiritual insight, While these early works were orthodox Christian, the religious aspect of his art acquired an increasingly eclectic character, drawing in elements and concepts from Asian religions to create a spiritual synthesis and unity of religious worship. 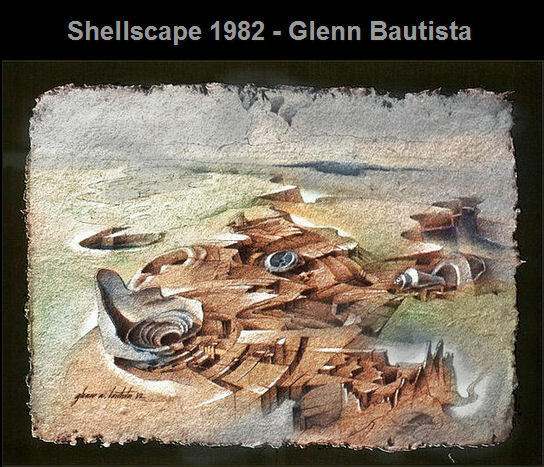 [Inner-Light] In the Seventies, the imagery of his art moved from the religious to the surreal, as in his Inner Light Series, 1975 in oil on canvas, with titles such as Buried Time, Aquascape, Firefly, Transience, and Woodscape. It is, however, important to note that the surrealism of Glenn Bautista draws its original principle from his religious works. The sacred aura and luminous presence of his earlier works became gradually shifted to another context, this time the surrealist vision. 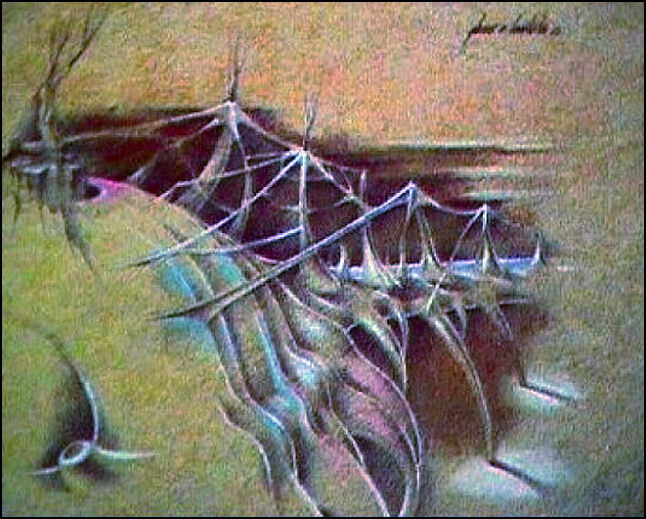 [Pastels] How are we to define the specific character and quality of Glenn Bautista’s surrealist vision by which it distinguishes itself from the work of other surrealists? In terms of quality and feeling, it is, as we have earlier mentioned, drawn from his early religious consciousness. 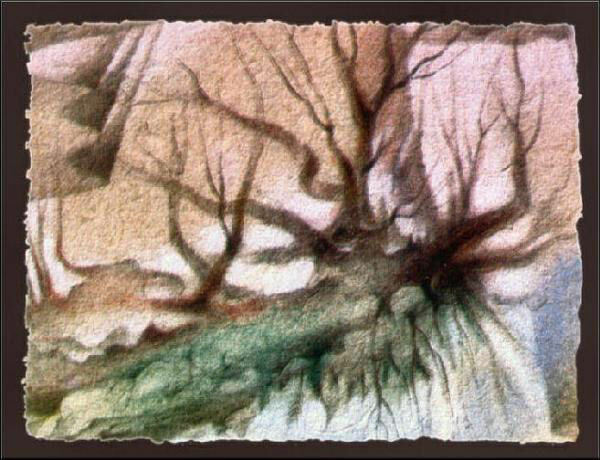 Thus, whether the subject be interplanetary outposts in a desert space, or trees and organic growths, it bears a spiritual presence beyond the original religious source. This abstractized religious quality is conveyed through the style itself, and, to a large extent, by the pastel medium as it is used by the artist in his individual style. In his hands, pastel assumes a rare suppleness, which, however does not preclude the clear and precise articulation of detail, the aura, spiritual or magical, is the effect of his exquisite control of light and tone. It is indeed surprising what a large tonal range can be accommodated within a small format of twelve and one fourth inches square. Often, light shines from within the forms like mysterious and beckoning Grail. It may flood valleys and gorges in a soft radiance that contrasts with the raggedness of the cliffs rising around. Light falls, like cascades, like torrents, like silent water down the slopes or the steep inclines of unknown mountains. With the light, color modulates from the purple to rose to orange with shades of gray, as the hues are brought out in all their original vividness and in their entire range of expression. Because of the intense concentration of imagery in a small format, along with the artist’s mastery of his technical means, and the flexibility and suppleness of his handling, many of the works achieve the macrocosmic dimension in their visionary scale. A small work — significantly, a square field with its equal sides — contains features on microcosm, which, in their rich and intricate interrelationships, project infinitely into a vast macrocosm, the multiple universe of endless space. The tonalities of light and dark when put into service of the linear perspective of surrealism create a trajectory into infinity, above and beyond the painting’s visual field, particularly since the artist does not mark a horizon line but telescopes, structures and crops the boundless image within the confines of the ordering square. [Abstractions] In fact, in a number of his works, Bautista has modified traditional perspective of linear convergence into more complex formulations. In some striking works, the schema of perspectival lines is elaborated into a contrapuntal network of lines that touch at points, separate and recede in an irregular zigzagging movement. The pool or subterranean depth from which a light wells out and radiates from a series of concentric layers and softly articulates the environing shapes. Another kind of perspective is off-centered and asymmetrical, as in semi-circular low-lying valley or river basin that interplays with steeply rising cliffs or a flat desert. The point of view from high Olympian vantage points is omniscient, spanning an immense temporal and spatial distance. 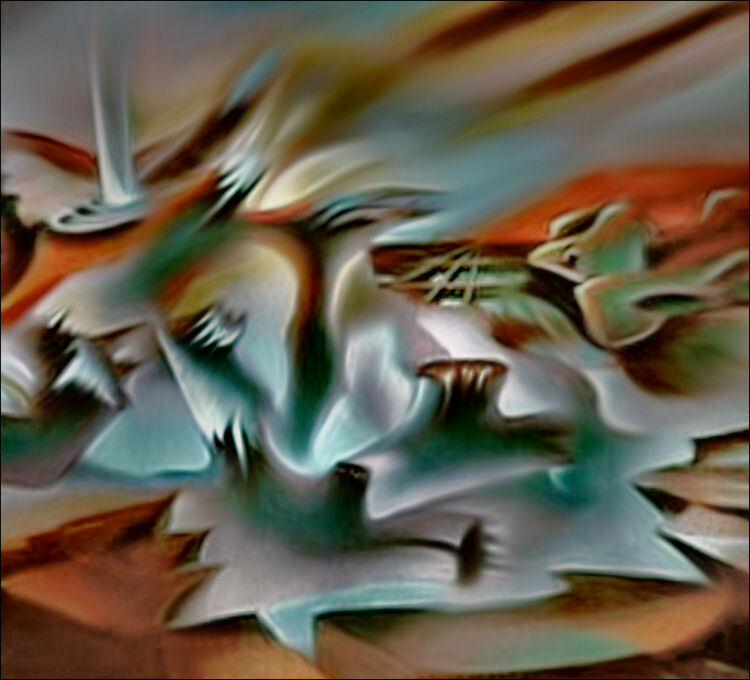 [Heaven&Earth Oils] Thus, in these images of mystical evocation, the primitive archetypal past and the interplanetary future converge, as they reveal (and the artist has identified this as a central theme) underlying similarity of structures. The winding and tortuous mountain trails of what seems like an abandoned sky-city of Andes, Machu Picchu, perhaps, find a contemporary echo in the elaborate system of gas pipelines in a highly industrialized region, the Ruhr in Central Europe, for instance. For one, however, the images of ancient cities and ghost trails in inaccessible mountain fortresses often include the element of the organic, in the allusion to strong and ancient roots that reach down into the depths of the earth. On the other hand, the images of pipelines and what they signify of advanced industrial technology convey, in their formidable metallic structure a latent protest against dehumanization of man and decentering of his unique personality by the mammoth of mechanization. The concept of an inexorable industrial ‘‘progress’’ and the toll to the human spirit that it exacts coalesce in the powerful image of the bird’s claw with its avid and cruelly pointed talons that seem to spread out from a hard center of unrelenting steel. 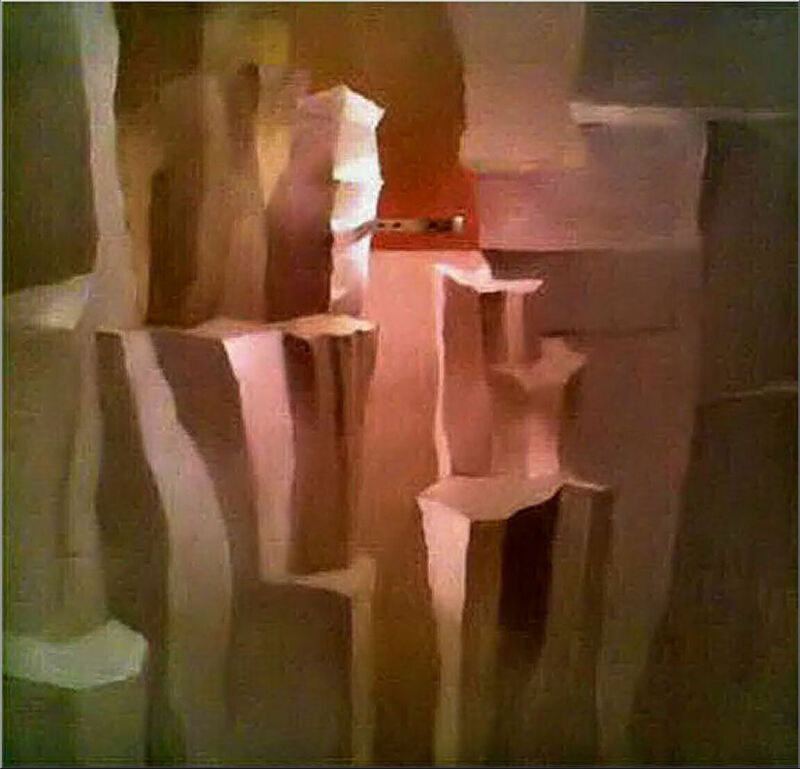 [Folded-Cut-Torn Pastels] In all the pastel works, however the sophisticated sense of structure the interplay of past and present and of the organic and mechanical the atmospheric space, and the quality of light blazing like a flare or softly phosphorescent-like marine forms glowing in a subterranean seas, are constant themes, of which the primary is the pervasive aura of spiritual presence the mystical, now abstracted from original context of religious orthodoxy. [Art Photos] [Insects/Photos] The same imagery as in the pastel works occurs in the photographs which are instant constructions, usually of sand and found objects, combined with sculptural forms, photographed in site. Close-up photography lends the subject of shells, rocks, and leaves, chambered nautilus, and an occasional surprise, in a rearing head of Christ, the illusion of actual existence, because of the camera’s natural function of recording material reality. It is best to relate the pastels to the photographs and vice-versa, because such comparative viewing brings out keenly the way in which a subject undergoes a shift in meaning as it is transposed into a different artistic medium. In these works, the artist is intrigued with the variation of existence of a visual sign appearing in art. 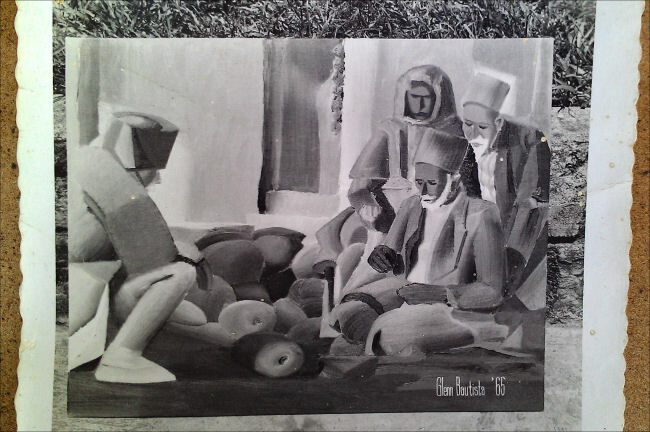 In fact, the same concerns and interests which may easily grow into obsessions, also find expression in the cement relief sculptures which give the subjects another, a third, dimension of existence, this time three-dimensional with solid mass and texture. [Bas-Reliefs] In both the pastel works and the cement reliefs, the format is square, thus pointing to a real interrelationship. The textured white fields of his reliefs correspond to the desert sands of the pastel works as well as to the fine beach sand in the photographs. It becomes clear that in Glenn Bautista’s works, sand is a medium, actual or illusory, which, like water, is an essential part of this surrealist vision which both conceals, submerges or blankets like snow at the same time that it reveals and exposes mysteries of the unconscious. [Collage-Drawing] The artist rises to the conscious level and reckons reality in all its color and movement in his big collages that take off from posters and in his smaller works of mixed media that combine collage, line drawings, pastel passages and rubbings. Done in Germany, these show the contemporary First World urban environment impinging on the artist’s consciousness from all directions. The imagery of these works conveys the sophistication of cineclubs, theaters, and outdoor cafes the very structure of a well-ordered bourgeois urban milieu in the rubbings of fire hydrants, manhole covers, street signs with the immediacy of their textures, and in the vintage appeal of Chaplin posters in the context of European pop. [Cogon-Abaca Drawings] Not to be overlooked is a collection of small works on paper — particularly finely textured handmade paper from cogon and abacaproduced in Baguio studio-workshops. On these, the artist has painted with pencil and pastel European landscapes of a more familiar and reassuring scale and on-the-spot renderings of elements of the urban scene: houses, doors, windows, interiors, with particular interest in their framework and structural features. In these he has consciously brought out the textural particularities of the handmade paper to become elements of meaning in the image as a whole. At times, one senses the superimposing of two planes of existence, the European and the Philippine in the medium and the image, at other times, these two planes originating from different cultural contexts and sensibilities, remain separate and apart. 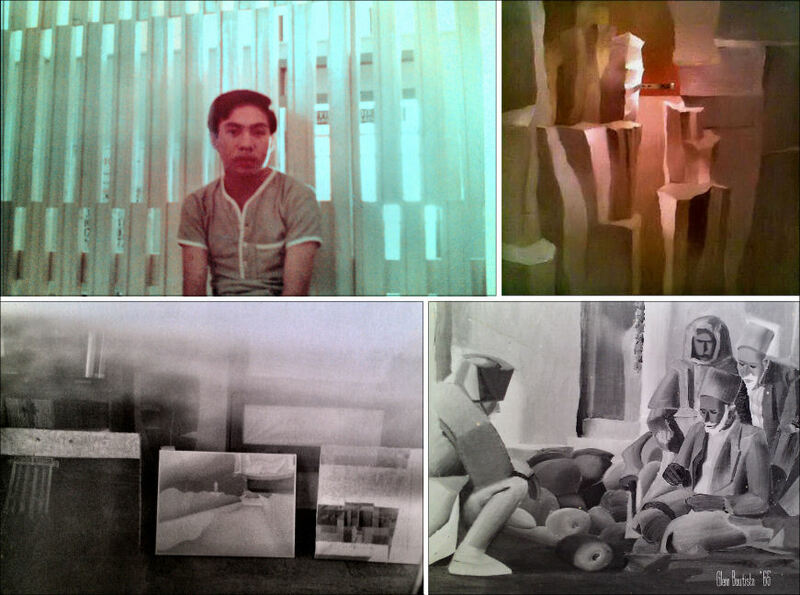 [Garland Pastels] But there is always and increasingly more in the art of Glenn Bautista whose artistic creativity is multifaceted and multidirectional. His lithographs, for instance, can challenge the best in the international scene. His surrealist works are true individual reformulations of that probing vision. In his works, form and vision seem to vie with each other in their pursuit of new directions and discoveries in the vast unending field that is his artist’s terrain and which he explores in its dimensions of time and space and in its surface life and materiality as in the deep and subterranean movements and phenomena of man’s other self. About the Author: Studied at the College of the Holy Spirit and the Universite’d Aix-Marseille in France as a scholar of the French Government. 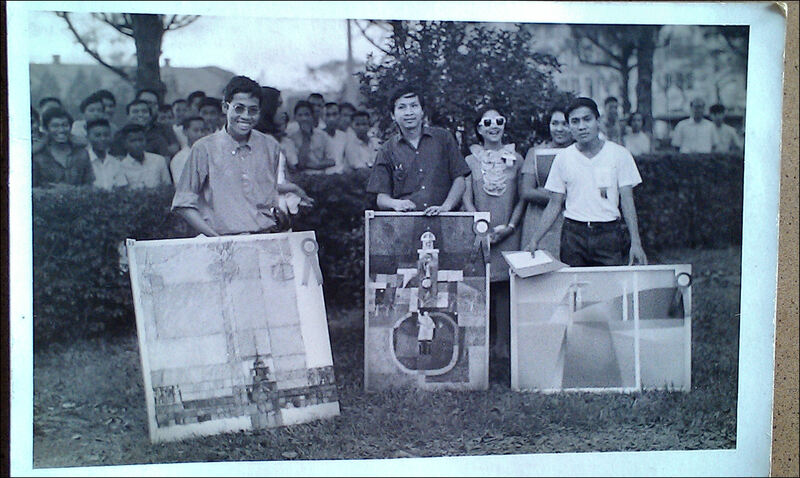 She finished her Ph.D (Philippine Studies) at the University of the Philippines with the dissertation entitled “Protest/Revolutionary Art in the Marcos Regime”. 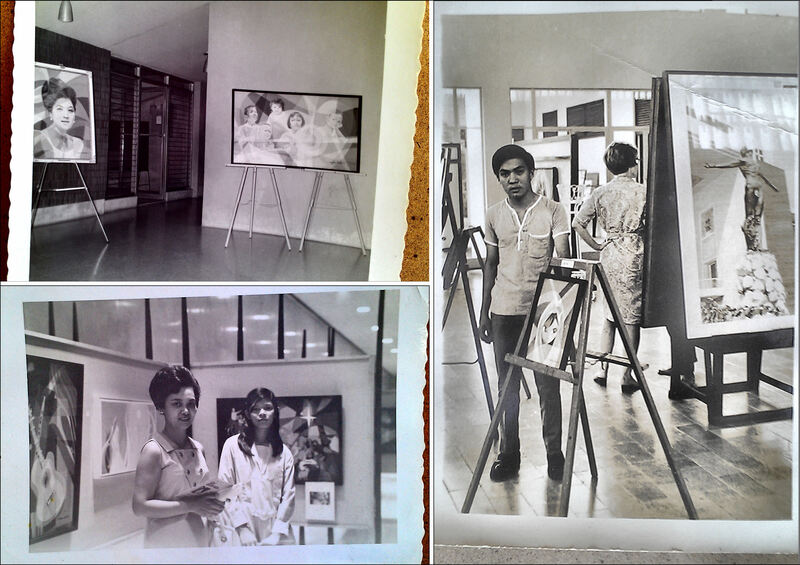 She was the recipient of the Art Association of the Philippines Art Criticism Award in 1976. She also received the UP Chancellor’s Award on Best Research in 1996. 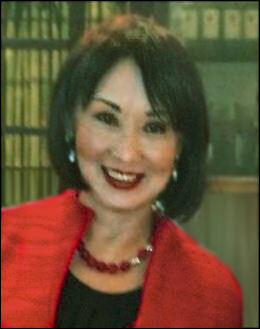 In the same year she was a Research Fellow of the Japan Foundation in Tokyo. She is married to the poet Gelacio Guillermo and has two children, Sofia and Ramon. . . This photo of me must have been taken in 1968, so 1968 less 1947 (my birth year) = 21. 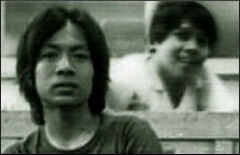 This must be a good guess ‘coz this was how I looked when I was 21. 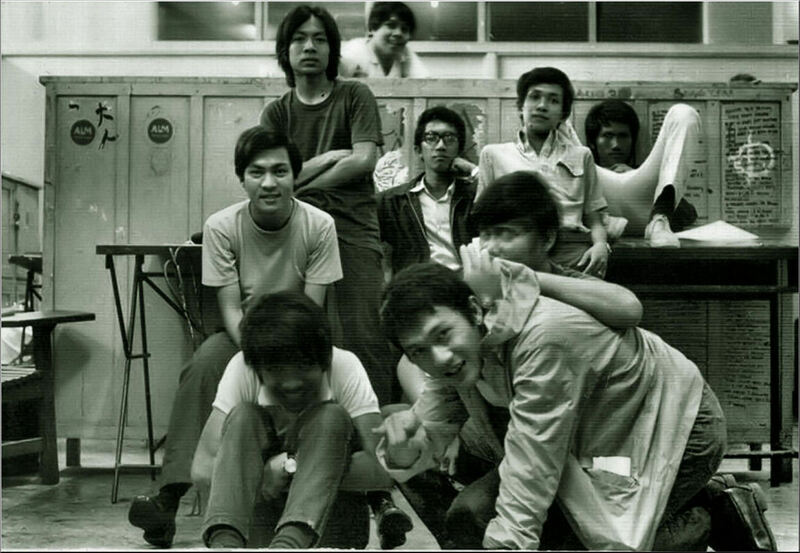 This photo must have been taken by my father, or by me using the 120 Yashica-D twin lens box camera’s self-timer. This was really my father’s camera, a camera he used while he was in the US during his studies in theology in New York. To my left are two of my artworks: The pen & ink line drawing of the interior of the Central Methodist Church (circa 1963) based on a sketch I did, showing the left pulpit or lectern, and on its right, the box for the choir. Mrs. Daisy de Pano Parungao was our choir conductor then. Two of the pews on the foreground represent the many others behind. I used to fall asleep in these pews when the worship services were too long. The front railing with knee red cushions are for those who would either take communion, or just for a special prayer request or dedication, or for Glenn to take his first, second or even third drink of ‘grape juice’ and 3/8’ of bread, until my father whispered to my ears . . this is your last, Glenn, ok? . . . you might go past over heaven. Having lived at the Central Church parsonage (interior- – all varnished wood) for eight years, I am quite familiar with its every ‘nook and cranny’. Below the pen and ink, is a study for a stained-glass window, having been influenced by the beautiful transparent colors of the many stained-glass windows at the Central Church interior, created by a certain craftsman, Mr. Kraut. His medium was the authentic material for stained glass work called, ‘antique glass’. The books to my left were those of writers, Roger Fry, Herbert Read, CS Lewis and a few art brochures from art exhibits I had visited. The drawing board I was working on was handcrafted by my elder brother, I call, “Kuya Jun”, who now lives in Cerritos, California with his beautiful wife, Julie and lovely daughter, April. The ‘rattan’ table on my left is part of the parsonage’s furniture set. A “Digi-Ana Portrait“ I recently created for Kuya Jun, Ate July & April. Photos of Ate Julie and April, Kuya Jun and Ate Julie were taken shortly before they left the Philippines for the US. They now live in Cerritos, CA. This was my first oil painting copied from a small illustration about human anatomy from one of three books (below the stained-glass study) given to me by my father’s missionary friend. I will ask David to look for his name written on the three art books. These books are really a compilation of lessons from the Famous Art School instructors from the US, such as Norman Rockwell, Ben Stahl, etc. This was also the time when I won an international art competition held at the New York World’s Fair. Well, time really flies. I never realized that one day, I would be looking back to write about these photos David showed to me the last time I visited home. OBLATION: http://en.wikipedia.org/wiki/Oblation_(University_of_the_Philippines): Several replicas of the Oblation were made for campuses of the University of the Philippines, some by National Artist Napoleon Abueva. The Oblation at the U.P. Visayas campus in Iloilo City was made by Professor Anastacio Caedo. 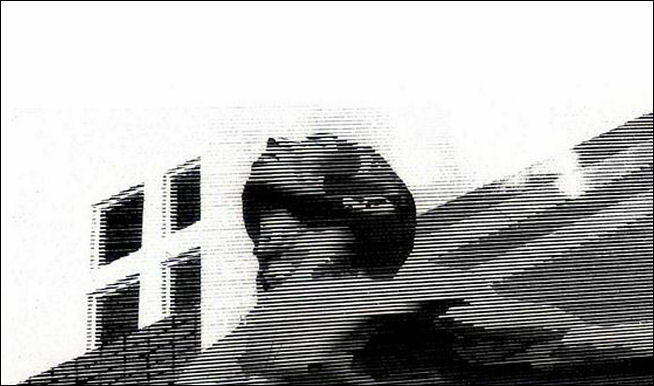 2005 National Artist nominee Glenn Bautista , likewise, did his celebrated version of the Oblation in pen and ink as part of his schoolplates at the U.P. College of Fine Art under Professor Rebillon. The sculpture was registered at the Intellectual Property Office in the year 2004. Being the main symbol of the university, the Oblation is the centerpiece of many U.P.-related logos, like those of the Philippine Collegian and other official student publications, the U.P. Cooperative, and the U.P. Centennial emblem. 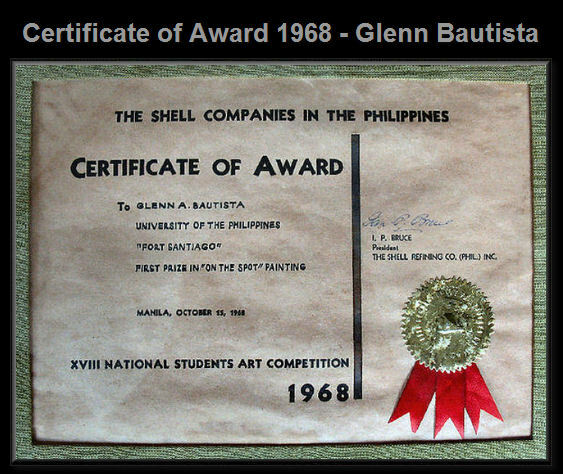 I, somehow, remember International Beauty Queen, Gemma Cruz in a photo of this Shell Students On the Spot Art Competition’s Awards Ceremony. I hope to find it one day to include in this blog. 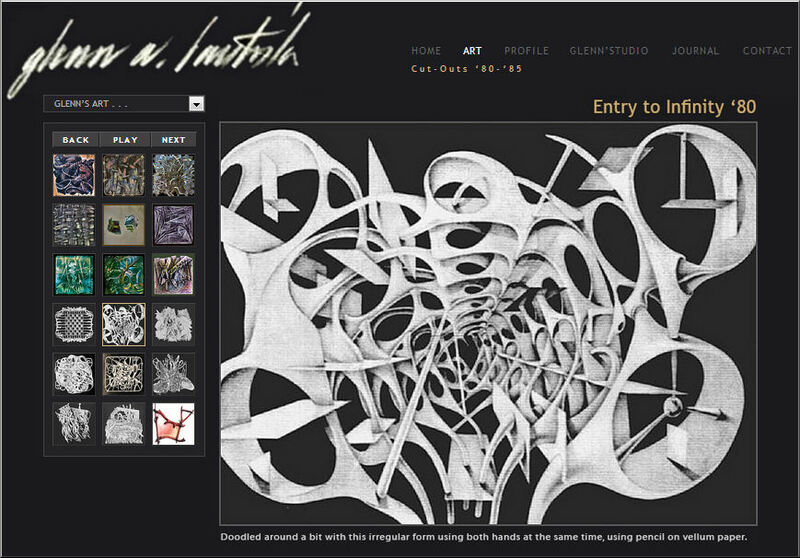 I also wish to find an image of my prize winning “on the spot painting artwork” of, “Fort Santiago”. Hi Gemma, I wrote something in your FB message box. After this, I also want to ask you something about the Aguinaldo Centennial Commission in relation to a portrait of Aguinaldo I did that won 1st prize during my student days at UP. 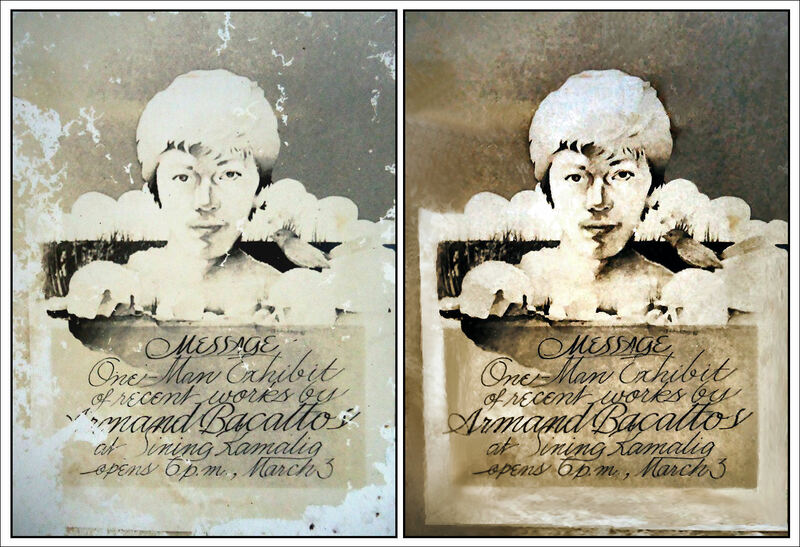 I’ve looked around for that Aguinaldo mural, but in vain. I hope you can help me find it. Take care, God bless. 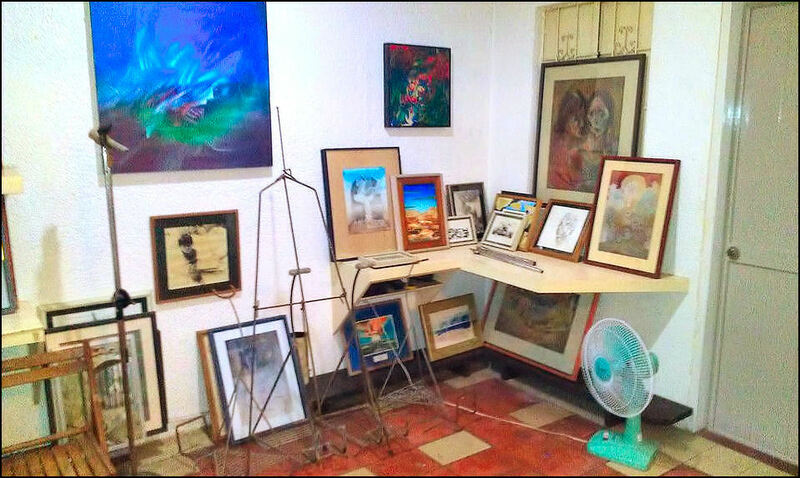 Emmanuel Garalde: I hope this is a better photo of the exhibit at your gallery at Sining Kamalig. I am still looking for the negative. 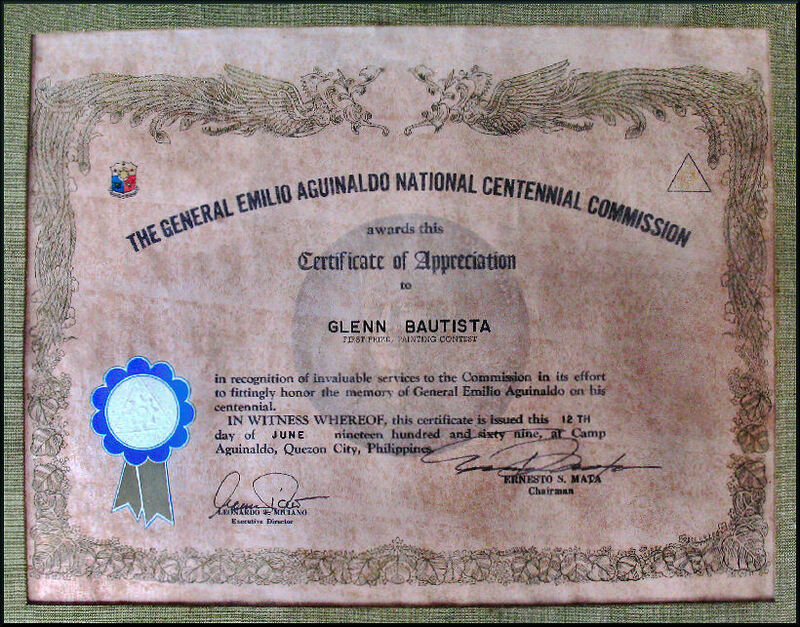 Glenn A. Bautista: Thanks Noli bro. Yes, this is a lot clearer. Pls find the negative so we can have a bigger size and resolution for this significant photo of our UPCFA mates and partners. I have fond memories of this gallery/art school. I will write about it and post a blog together with this photo. Sorry, same as UPCFA days, puro requests, hehe . . . God bless, bro. Hi Noli, got to view this poster of Bim you posted just now. Couldn’t resist retouching it. Not a very good job, I know . . . can you give me the link of this particular post? I couldn’t find it again. — with Armand Bacaltos at San Melia – Houston. Armand Bacaltos: Gawin kong profile pic ha? Glenn A. Bautista: Bim bro, may oras, araw at buwan, walang taon? Glenn A. Bautista: Eh, Tatay kong si “Asyong” ay tunay na Pastor at Kun-duktor ng La Mallorca Pambusco sa Pampanga . . may pinagmanahan, hehe . . sa bus nya na meet ang pasahera na nanay ko, si “Enyang”. Armand Bacaltos: Wala nang taon, kasi dinistribute mga two weeks before kaya understood na. Tinamad na rin baguhin yung layout ng script, haha. 1975 yan. 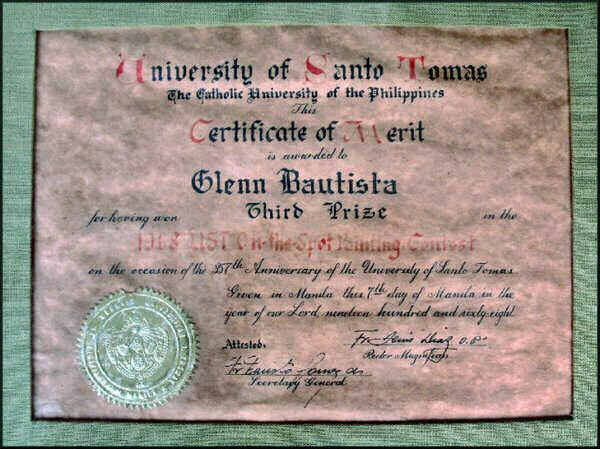 Even as a student in the College of Fine Arts of the University of the Philippines, Glenn Bautista showed extraordinary accomplishment in art. Proof of his exemplary gifts are his drawings. One of them a personal exercise he did of the Guillermo Tolentino’s Oblation, the statue in front of Quezon hall that has become symbol of academic freedom in the University, with the ordinary medium of pen and ink on paper, he executed a precise and finely modelled drawing 6/ft. by 3’ft. of the statue in three-fourths view against the setting of the administration building. This he executed in a most difficult technique which required drawing fine, perfectly even, and precisely spaced horizontal lines, with tones and shadows exactly rendered by means of closer intervals. It was a highly disciplined exercise demanding the perfect coordination of eye and hand, as well as total control in the draughtsmanly execution of the thousands of parallel lines, without the least faltering, unevenness or inaccuracy which would easily show as imperfection in the demanding work. The wonder of it was that so impeccable was the completed drawing that the technique, extraordinary yet unobtrusive, gave way to the perfect clarity and justness of the graphic image. Most of these drawings were initially lightly sketched using poisonous charcoal I extracted from batteries I found on the wayside. I eventually worked further on these drawings upon reaching home. I made it a point to apply fixatif protection on both sides of the drawing. (pen & Ink drawing) . 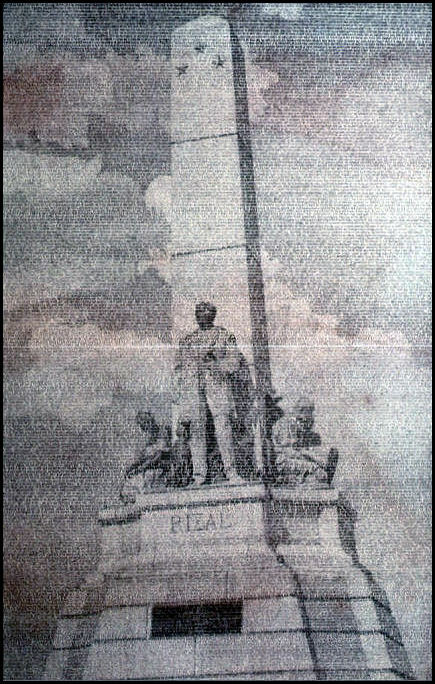 Rizal / pen & ink – a take off from a school plate / UP-College of Fine Arts, Diliman, Quezon City. 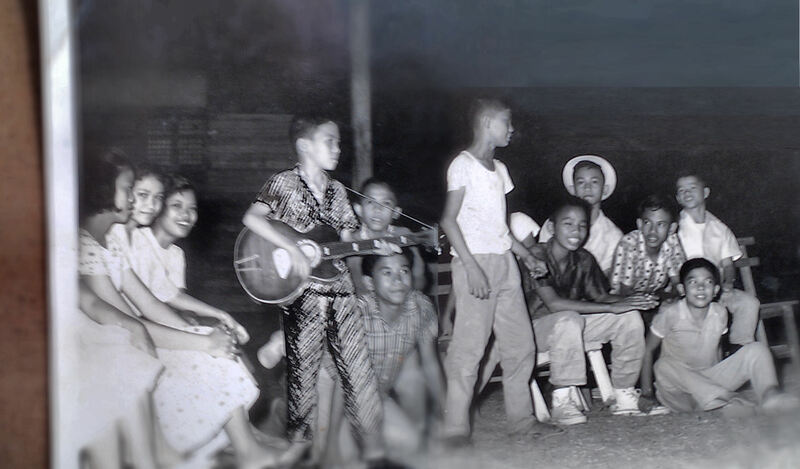 • Glenn A. Bautista: Yes, DingR, I have been digging up images from my hard disks and photos sent in to me by David, many of which I had not seen. Just organizing these images is not an easy task. But having the present digital tools right in front of me, I should not really be complaining. Now, I seem to understand why you love to write, a skill I have totally neglected. 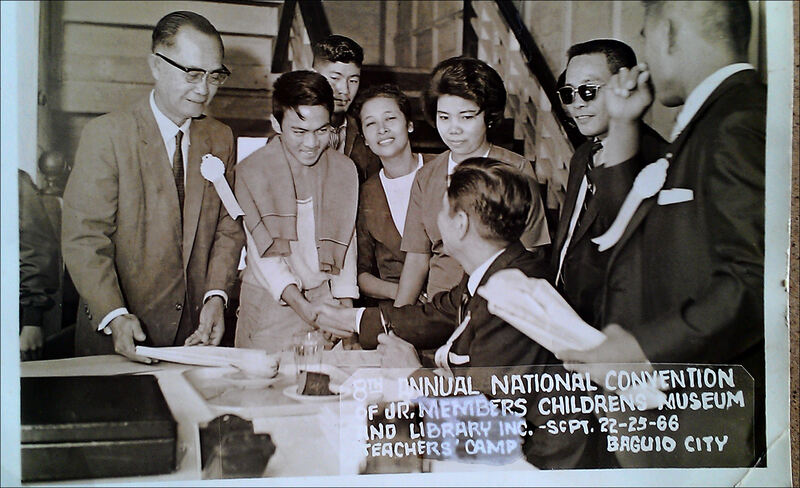 Thanks, DingR . .
Another photo w/ Senator Jose Diokno . . this was “Free Press” times. I remember names like Climaco, Salonga, Recto, Osias, Osmena, Laurel, Manahan, etc. I used to read Leon O. Ty’s political magazine, “Examiner” and those of Soc Rodrigo’s. I had my Arts & Sciences and Fine Arts subjects which buildings were not too far from each other – – a good walk for an exercise in between subjects. I was enjoying two scholarships that allowed me to finish college, UP College and University, and CMLI scholarships. A third and fourth scholarships for further studies I availed of were for US and Germany. While Glenn Bautista has devoted his entire creative imagination to the creation of ideal spaces, he is aware that real problems exist within the physical boundaries that contain his being and that of his family. Relief from the difficult and harsh situations in which most Filipinos lives can only be achieved by a truly concerted effort that breaks down traditional community policy. This is a personal cause to which Bautista has committed himself – at the creation of a practical vision that can turn the Filipino community not into an impractical arcadia but a source of inspired well-being for every Filipino. A farmer prepares the soil before sowing the seed and nurtures a plant or a tree until it bears fruit. Likewise, the government and the private sector can help nurture the Filipino until he realized his full potential. Thus, the premises for a concept of a Filipino community have been laid down. It is comprised of linked and caring ideas focused on the Filipino, his life and domicile – an antidote to the many problems from whence sprouted our community’s major ills. New communities rise and many more are coming about. Taking closer view of each of them one can see a glaring commonality. They are nothing more but a cluster of houses with access to a main road artery, and with basic utilities like water supply and electricity. Depending on its size and affluence, some have recreational facilities and a place of worship. These communities provide shelter but nothing beyond that. Their dwellers will have to travel to their place of work, to shopping areas, to entertainment centers, etc. This inherent conceptual weakness is the reason that despite the decongestion moves pursued by the government, traffic still continues to worsen. From this spring out other related nightmares: air-pollution, waste of resources like energy and man-hours. Suburban subdivisions, just like all other communities, depend solely on the government for the proper disposal of garbage. From within their own groups almost nothing is done to assure that the neighborhood is freed from unsightly, unhealthy pile of stinking rubbish. Obviously, this is one of the causes of floods, diseases and environmental pollution. And what is more pathetic is that housing subdivisions remain unproductive pieces of important resources; land and building structures resources that otherwise would be dynamic assets contributing significantly to an economy wanting to be vibrant. But no, they only house people and nothing more. They are breeding grounds for social ills. Such a pronouncement might sound illogical until one considers the additional pressures placed on economic centers to provide gainful employment for an ever increasing workforce. Joblessness, any way you look at it, can only mean poverty and increasing crime. 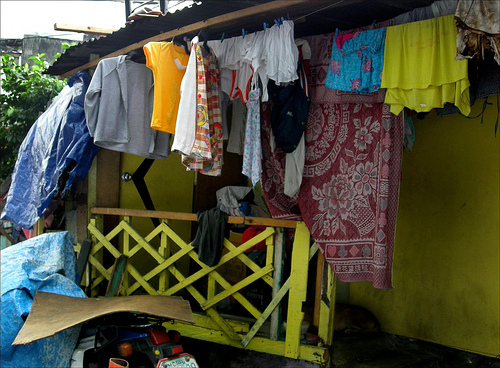 Now that the signs of an economic take off are clearly manifesting themselves, it is paradoxical to expect further deterioration of the ordinary Filipino’s quality of life. Or is it? I really find the twenty & one funny, tante. . I grew up in the Methodist Church . .
do you have anything to do w/ him? ps: Constante P. Tagamolila (Tante) (retiree) was chosen as one of 100 “Outstanding Augustinians of the Century” by the University of St. Augustine in the Philippines. know and I’ll never forward another lousy joke again. Glenn, Wow! You really are a religious family! think less of me after knowing this. with my travelling group just before noon. It was held at the basement of the rectory. being said in the adjoining church. by me, but the lowest bill I have was $20. I have a confession to make. Please do not think less of me after knowing this. an FT (in my own way), i guess, Tante . .
really! i replied 2 ’em ‘ol .